Madawaska, ME (November 12, 2014) — Twin Rivers Paper Company a global leader in the manufacture of innovative printing and technical specialty papers, is pleased to announce the acquisition of specific envelope assets of the Cascades division in East Angus Quebec Canada. The addition of the Twin Rivers Enviro Kraft™ Envelope to the product line provides an ongoing and consistent source of supply to long-standing customers of these grades. With product development complete, the Madawaska Paper Mill will begin commercial production in the coming weeks. Cascades and Twin Rivers representatives worked closely through the development process and will continue this cooperation to ensure a seamless transition of the business moving forward. 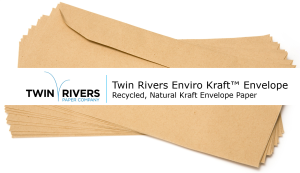 Twin Rivers’ Enviro Kraft Envelope will be manufactured to the same high quality specifications that converters and consumers alike have come to expect from the grade. With an 80 year papermaking legacy, Twin Rivers is known for its flexible assets, strong technical foundation, commitment to service excellence and environmental stewardship. The company manufactures a range of bleached and unbleached papers used in a variety of publishing, packaging and label applications.